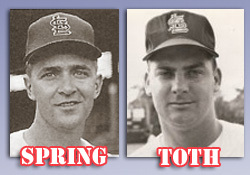 For pitchers Jack Spring and Paul Toth, being part of one of the Cardinals’ best trades did little for their careers other than making them answers to a trivia question. Who were the players the Cardinals acquired with outfielder Lou Brock from the Cubs on June 15, 1964, for pitchers Ernie Broglio and Bobby Shantz and outfielder Doug Clemens? Because of the impact of the deal on Brock and the Cardinals, few recall St. Louis got anyone else in the trade. Brock sparked the Cardinals to the 1964 National League pennant and World Series championship and built a Hall of Fame career in St. Louis. For Spring, the Cardinals became a brief stop during a year in which he played for three big-league teams before finishing the season in the minors. For Toth, the trade was a reunion of sorts, returning him to the organization he started with but doing nothing to get him back to the major leagues. Spring, 82, died on Aug. 2, 2015, leaving Brock as the sole survivor among the trio the Cardinals acquired in the trade. Toth, 63, died on March 20, 1999. Spring, a left-hander, debuted in the major leagues with the 1955 Phillies. He also pitched for the 1957 Red Sox and 1958 Senators before joining the expansion Angels in 1961. In four years with the Angels, Spring was 11-2 with eight saves. In 1964, Spring began the season with the Angels before being sent to the Cubs on May 15 in a cash transaction. Five days later, on June 20, Spring made his second and last Cardinals appearance. In two innings of relief against the Giants at St. Louis, Spring gave up five runs on five hits, including a three-run double by Hal Lanier and a two-run home run by Orlando Cepeda. All the runs were unearned. Boxscore. Spring had yielded nine runs in three innings for St. Louis but had an ERA of 3.00 because only one of those runs was earned. The Cardinals assigned Spring, 31, to their Class AAA club at Jacksonville, Fla. He refused to report. If he was going to accept a demotion to the minor leagues, Spring, a resident of Spokane, Wash., preferred to play in the Pacific Coast League. On July 9, the Cardinals accommodated Spring, sending him to the Angels in a cash transaction. The Angels assigned him to their Pacific Coast League team in Hawaii. Bob Lemon, the Hall of Fame pitcher, was Hawaii’s manager. Spring thrived there, posting a 3-3 record and 2.11 ERA in 30 games. Spring got his final big-league chance with the 1965 Indians, pitching in 14 games. He spent the remainder of his playing career in the Pacific Coast League, finishing with his hometown club, Spokane, in 1969. Unlike Spring, Toth was sent directly to the minor leagues after his trade to the Cardinals and never returned to the big leagues. Toth, a right-hander, was signed by the Cardinals as an amateur free agent in 1955. He pitched in their system until 1958 before spending two years in military service. When he resumed his playing career in 1961, the Cardinals assigned Toth to Class AA Tulsa. He had his most successful season, posting an 18-7 record and 2.37 ERA. That performance caught the attention of Cardinals manager Johnny Keane. At the 1962 spring training camp, Toth got to pitch in exhibition games for the Cardinals and did well. He held the Mets to a hit in three innings in the second exhibition of the spring and was cited by The Sporting News as the “sleeper” prospect of the camp. “Paul showed a good assortment and plenty of poise,” said Cardinals pitching coach Howie Pollet. Less than a month later, though, on Sept. 1, the Cardinals traded Toth to the Cubs for pitcher Harvey Branch. Toth was 8-12 in three seasons with the Cubs. He was with their Salt Lake City farm club when he was traded back to the Cardinals in the Brock deal. The Cardinals assigned Toth, 29, to Jacksonville. He was 4-6 with a 3.25 ERA. After the 1964 season, Toth was sent to the Yankees, managed by Keane, in a cash transaction. Toth never pitched for the Yankees, finishing his playing career in the minor leagues in 1967.